It's hard to know where to start with this one, so we'll just state the facts. Animal Collective is poised to sweep just about every year-end list in the coming weeks. Everyone will be talking about Merriweather Post Pavilion and its merits, but that didn't sound like much fun to us or the band, so we asked Avey Tare, Panda Bear, Geologist and Deakin to go bananas with our annual NOW Issue, which will hit newsstands and the digital zone on December 15th (sooner in some places). 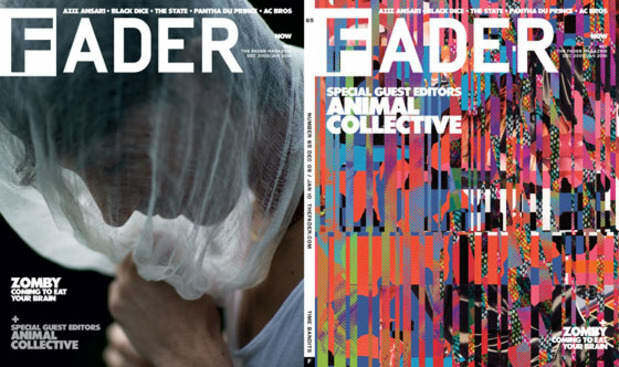 For now, we just want to share the covers: On the front is Animal Collective as photographed by Jason Nocito and spliced through the brains of AC friends, Black Dice member Bjorn Copeland and frequent collaborator Rob Carmichael; on the back is heretofore total enigma, UK producer Zomby, whom Animal Collective unsuccessfully tried to have open for them at one of their summer New York shows. Read all about that and other enlightening facts in our interview with Zomby and stay tuned as we reveal more of this very special issue in the next couple of weeks.